ZenAir has triple action performance. It takes advantage of not one, but three scientific filtration principles combined in one, to clean the air and trap unwanted and harmful particulate matter in the air. Agglomeration – making particles to stick together and form clusters. Conventional media use only impingement, whereas the older methods of electrostatic precipitator only use electromagnetic effects. ZenAIr combines both these into one simple yet effective air purification device. Air passes through Electrostatic fibre media which has an embedded mesh electrode. The electrode is connected to the high voltage power module and its dissipates charge evenly throughout the media pad. Everything in contact with electrostatic charge, media as well as particles become polarized. Agglomeration causes the polarized particles attract each other and stick together to form larger clumps. 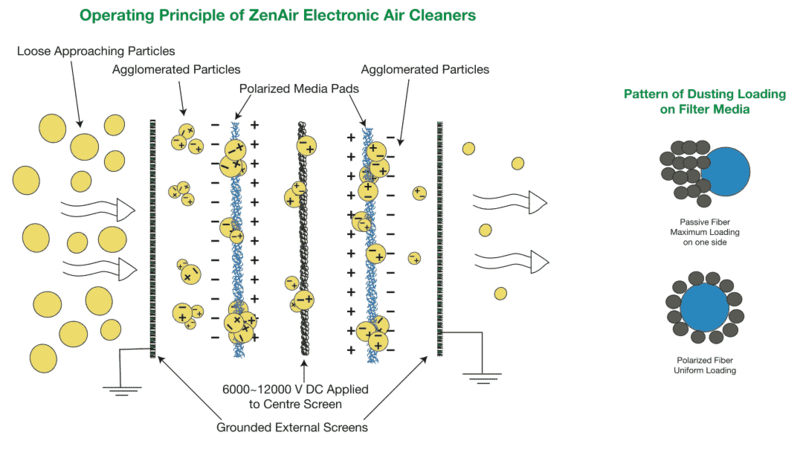 Agglomerated particle clusters get attracted to the media fibres and cleaner air flows out from ZenAir. To know more details on ZenAir, please write to us!